Moussa has run personal bests of 13:48.34 in the indoor 5,000 meters and 13:41.87 in the outdoor 5,000 meters. Ammar Moussa excels at one activity — running — that has made him a two-sport college athlete competing across all three seasons of the NCAA sports calendar. The senior at the University of Colorado runs cross country in the fall, indoor track in the winter, and outdoor track in the spring. 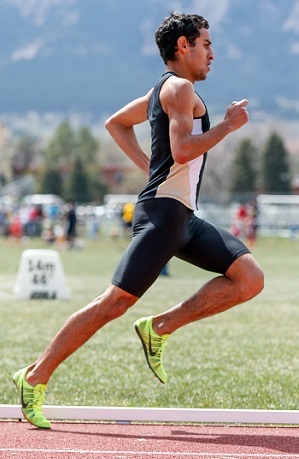 And this summer, after he has run his final race for the Buffaloes and earned his undergraduate degree in Political Science, Moussa hopes to continue competing for a chance to run in the 2016 Olympics in Rio de Janeiro, Brazil. Moussa has been part of two cross country national championship teams at Colorado, as well as four Pac-12 conference championship teams. He was an All-American in cross country as a junior, finishing fifth overall at nationals. On the indoor track, Moussa was an All-American as a junior and finished 10th in the 5,000-meter race at the NCAA Indoor Championships. On the outdoor track, he won the Pac-12 championship in the 10,000 meters as a junior. Born and raised in a Muslim family in California to parents who emigrated to the U.S. from Egypt and Morocco, respectively, Moussa can vie for an Olympic berth with Team USA, or he can pursue dual citizenship and run for one of his parents’ home countries. UMMAH SPORTS: Which events on the track do you consider your specialties? AMMAR MOUSSA: Indoor, I run the 5K and 3K. Outdoor, I run the 10K and 5K. Sometimes I dabble in the 1,500 but my focus is on longer distances. I’d consider myself more of a specialist in the 5K, since they have it for both indoor and outdoor. I’m using this indoor season as a springboard for the longer outdoor season and then to the Olympic trials. US: Is there one moment that stands out most from your career at Colorado? AM: Probably the biggest one was when we won our second straight cross country (national) team title in 2014. I was able to finish fifth in that race. I was really lucky and blessed to do that. Second was winning a conference championship in the (outdoor track) 10K last spring. My mother flew down for that meet; she hadn’t seen me run in a while, and my father was also there. But winning those team titles, that’s why I came to Colorado. So those were really special to me. US: Most college student-athletes are balancing school with one sport. You’re involved in a sport all year. How do you balance the academics with the athletics? AM: A lot of people think being a college athlete is easy and we have it made, and it couldn’t be farther from the truth. Being an athlete is a full-time job. It’s tough, especially if you’re also trying to be on top of your academic game. But we have a lot of academic support. They make sure we have tutors and we have priority registration, so we can schedule classes around practice. As the years go by, you figure out what works for you and what doesn’t. US: Is it also a challenge to keep up on your religious obligations, such as daily prayers, in between school and sports? AM: Absolutely. I’m lucky that I have a really understanding coach. 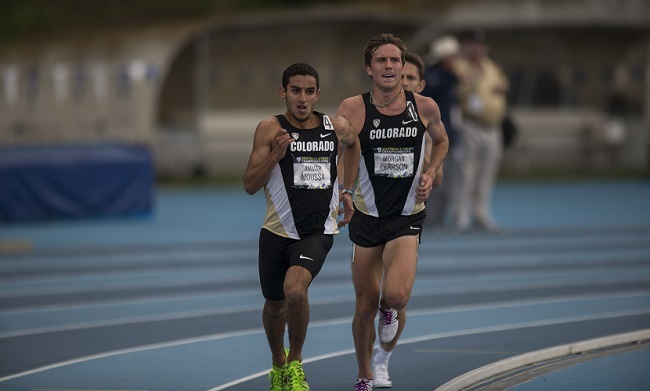 (Editor’s Note: Colorado’s track and cross country teams are led by Mark Wetmore, a five-time NCAA Coach of the Year.) If I have to pray salat before practice, he makes sure I can find a quiet room to do that. Our coaches have moved practices for me so I could pray. We’ve been on the road on a Friday and they’ve taken time out of their day to drive me to a masjid and wait for me during the jummah prayers. I don’t know how many coaches would do that. My roommates have been really understanding, too. If I need some quiet time to pray for five or 10 minutes, they’ll allow me to do that. I can’t overstate how lucky I’ve been to have good people around me. The administrators here even approached me to ask what steps they can take to put a prayer room in the athletic facility. US: Was your religion something that came up while you were being recruited? AM: It actually was. Colorado was the only school I felt really took it upon itself to make sure I was comfortable in terms of religion. On my (recruiting) visit, unprovoked, Coach (Wetmore) gave me an information sheet on a nearby masjid and he made sure we drove past it. He also took me to the mosque that Friday to pray. He was aware that I was Muslim; I didn’t have to tell him, and he made sure I was comfortable. I felt that was a testament to his character, and that’s one reason why I chose Colorado. US: What are some other schools who were recruiting you? AM: Oregon, North Carolina and Cal-Berkeley were the other schools I visited. I was also recruited by Oklahoma State and Wisconsin. US: A lot of people think of snow when they think of Colorado. Was that a factor in your decision, not only being an outdoors runner but also being raised in California? AM: Yeah, absolutely. I’m a California boy at heart; I don’t do well with the cold. I thought Colorado would be colder than it is, but more days than not it’s sunny and warm. The biggest factor for me in terms of recruiting was going to the school that would make me the best runner I could be, and a place where I’d have a lot of support. US: How is the Muslim community in Boulder, Colorado? AM: It’s a moderately-sized Muslim community. There are quite a few international students in Boulder, and in the Denver metro area there are a lot of Muslim families. It’s growing. Since I’ve been here we went from a 50-person masjid to a pretty sizable masjid. US: Leaving the house and being on your own, and as an athlete on a college campus, was it tough for you to maintain your principles as a Muslim? AM: Absolutely. I was challenged and I was tempted, and frankly, I let myself down in terms of my religion. I’ve always been part of a tight-knit family and I grew up fairly religious. But when you leave home and lose that structure — you don’t have your mother making sure you go to the mosque — it was easy to lose my way for a little bit. I absolutely fell down a couple of times. I was tested, and thank God I was able to find myself, find my morals and come back stronger to my religion. US: What brought you back from that brink of losing your way? AM: I think a big part of it, first and foremost, was the contention I’d caused in my family with the path I was living. Second, I just wasn’t happy with myself. The biggest thing is that religion gives us a rock — it gives us stability in this life. And I lost that. I felt that there was no structure in my life anymore and I wasn’t happy with that. It took me a while to realize why I was feeling like I was feeling. I thought I was doing what made me happy, but I wasn’t really happy. There was a lot of emptiness. When I started slowly coming back, I had a lot of encouragement from my parents, but the biggest thing is that it was my own decision. I started going back to it, getting that structure, praying and staying away from temptation. The closer I got to my religion, the happier I felt with myself. US: What are your plans for after college? AM: I have a couple of balls in the air. First and foremost, I’m going to pursue running professionally. I’ve put in a lot of time and energy into this sport and it’d be nice to see what I can do on the professional level. If not that, I’d like to get into government work and policy making. There is a lack of understanding in the West about the Middle East — people think they can just open up a book and understand the Middle Eastern culture and history, and that’s not true. Growing up in a Muslim household, in an Arab household, it gives me a perspective that not many people in our government have. I want to make things easier on the people who live out there. US: Have you been to Egypt, where your father is from, or to Morocco, where your mother is from? AM: Yes. The last time I was there was in 2009. US: Even though you grew up in a Muslim household, you were still raised in the U.S., which is not a Muslim-majority country. What was it like for you going from here to a Muslim-majority country? AM: For me, I felt more at home there. Here in the States, my identity doesn’t necessarily fit in with the values of everyone else. There’s a subconscious awareness of being an outsider. Being in Egypt and Morocco — and last summer, me and my brother traveled to Turkey — you’re an outsider in a different sense in that people know you’re American, but there’s more of a communal sense as Muslims. When the call to prayer comes on, you hear it everywhere, and you can stop whatever you’re doing and walk into a mosque nearby. Whereas in the States, I get a notification on my phone when it’s time to pray. It’s just not the same. I’m an outsider there, but I’m also part of something bigger than me. I felt at home and at peace there. That peace makes me comfortable. US: A lot of Muslim athletes don’t have to worry about fasting during Ramadan conflicting too much with their training schedule or with their competitive season. But you’re pretty much in competition or in training all year. Talk about how you navigate that dilemma. AM: I grew up playing sports, and I grew up in a house where — unless I was sick — I was fasting. Even before I was running, I played soccer and basketball growing up. When I started cross country in high school, Ramadan was during the fall. Then it shifted to the summertime, which is our biggest block of training; running twice a day every day. Then as I got into college, the workouts were harder and more grueling. I was expected to run more in the summer. For me, I don’t make excuses; I just do it. Some days are harder than others. It’s a challenge to wake up and make sure I get enough water before running 18 miles in a day. This year, the NCAAs and the Olympic trials both fall during Ramadan. I’ll have to meet with a nutritionist to make a proper strategy. US: Are you planning to go for the U.S. Olympic team, Egypt’s team, or Morocco? AM: I plan on going out for Team USA. Maybe if I decide to pursue post-collegiate running, I’ll get Moroccan citizenship. I have no interest in running for Egypt, given its current political state. But God willing, I’ll make the U.S. trials. US: How did you get into track and cross country in the first place? AM: I didn’t start running until my freshman year of high school. I did cross country to stay fit for soccer and I ended up being successful. I was a mediocre soccer player at best, but I was above-average in track and cross country, so I committed to it. I never thought until my junior year in high school that I could run in college. I was blessed; I just did it to stay fit and it worked out. US: Do you like one more than the other as far as track versus cross country? AM: To be honest, they’re relatively equal. Each has pros and cons. With cross country, the longer distances are more difficult, but I love the team aspect — I love competing for something bigger than myself. With track, there’s a little more excitement because everything is faster and you’re closer to the crowd. I guess my favorite is the one I’m currently running at the time. US: You have eyes on the Olympics, but what do you want to accomplish before finishing your college career? AM: Qualify for nationals and get a couple more All-American certificates. Just have fun with it. It’s been a while since I’ve had fun. I’m falling in love with the sport again. Whether I decide to continue running or not after this, I just want that final victory lap after nine years of (high school and college) running. I’ve been blessed. Whatever my last race may be, I want to step off the track and be happy with where I’m at and not have any regrets. 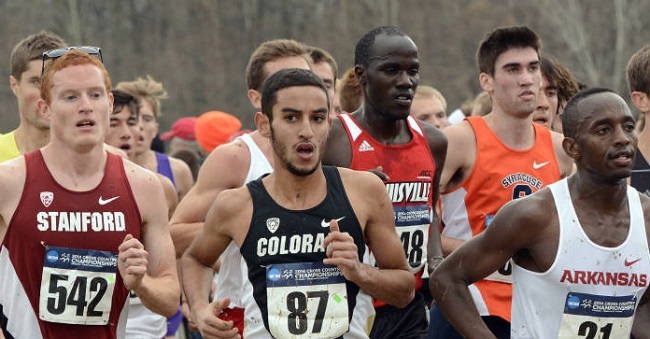 Moussa finished fifth at the 2014 NCAA Cross Country Championships.